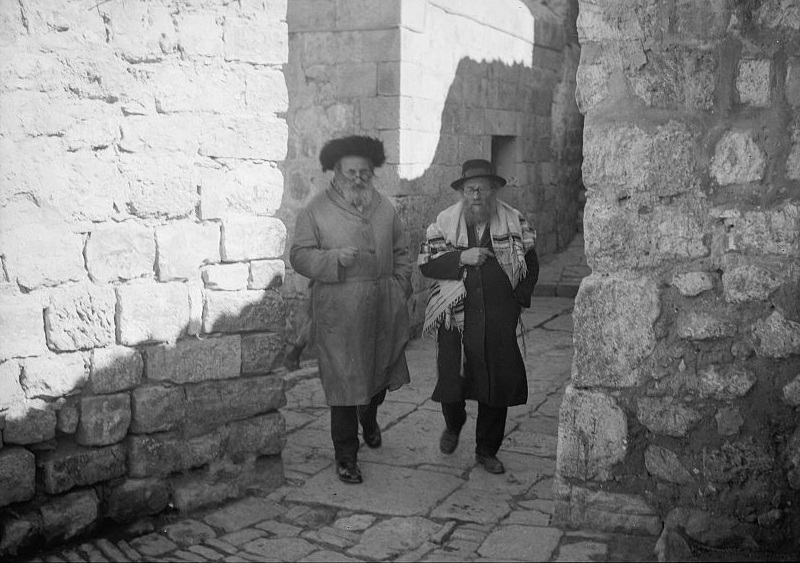 Ashkenazi Jews with the fur hats, and Sephardi Jews with the fez. 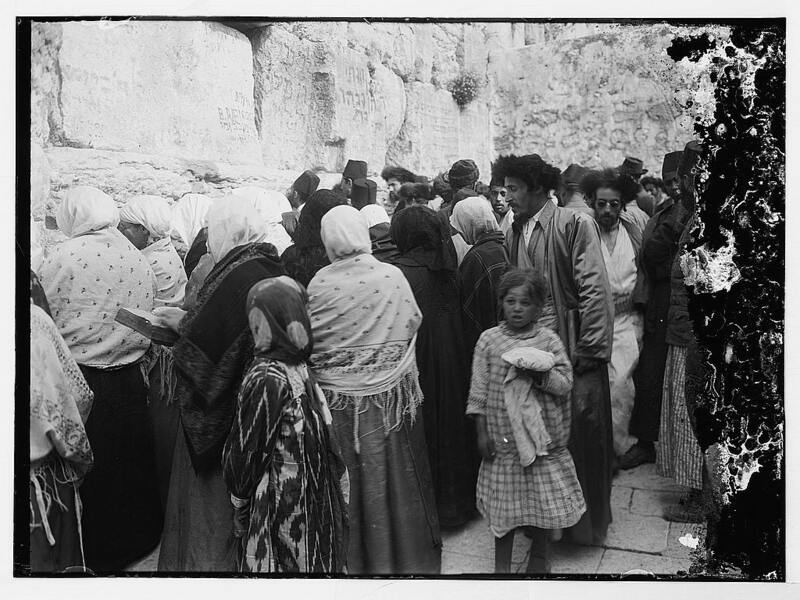 From the earliest days of photography, the Western Wall has been a favorite subject for photographers. 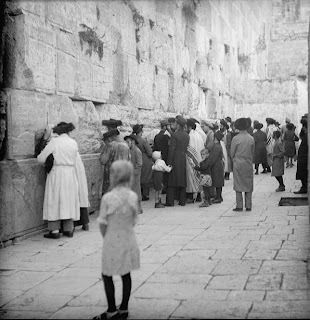 The Wall or Kotel was always a magnet for Jews who came to pray at the remnant of the Temple retaining wall. 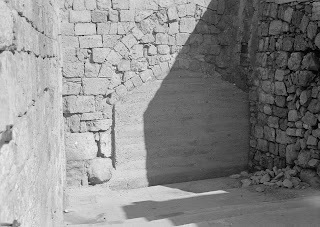 On the other side of that Wall once stood the Holy of Holies. 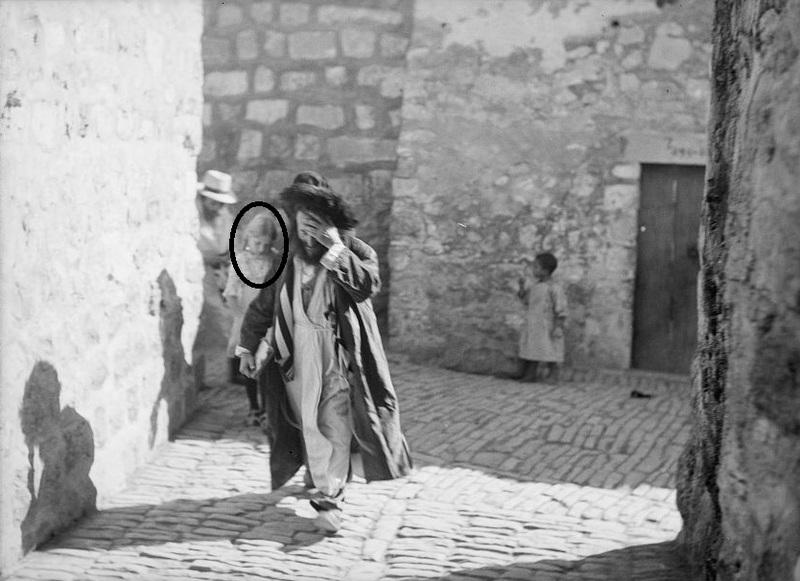 ﻿That's why this set of the American Colony's photographs of the Old City is so unusual. 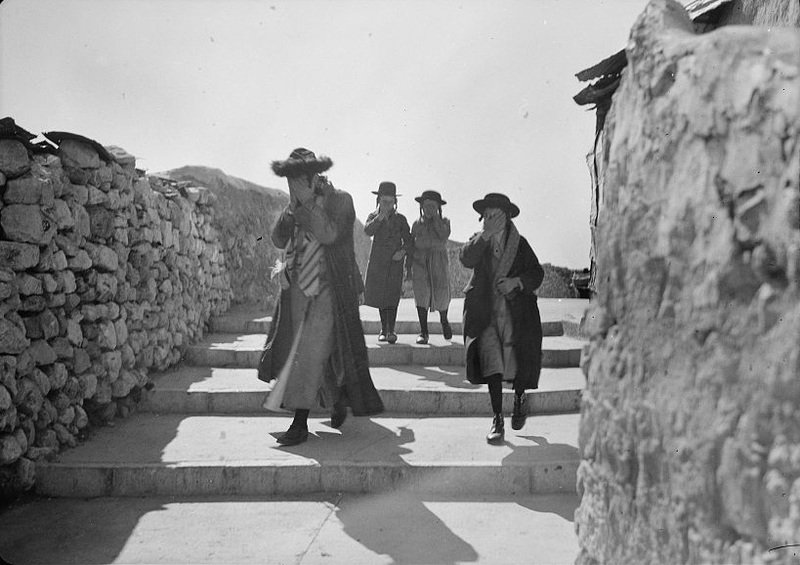 It shows Jews walking to the Western Wall between 1934 and 1939 "on their usual Sabbath* walk to the Wailing Wall," according to the caption. The subjects hide their faces because of their desire to avoid being photographed on the Sabbath. 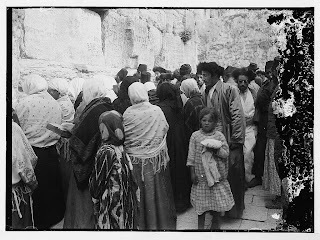 Possibly because of the dangers there are few women or non-Orthodox worshipers in this set of pictures. Yet, one little blond girl appears in two of the pictures. Click on caption to see original. 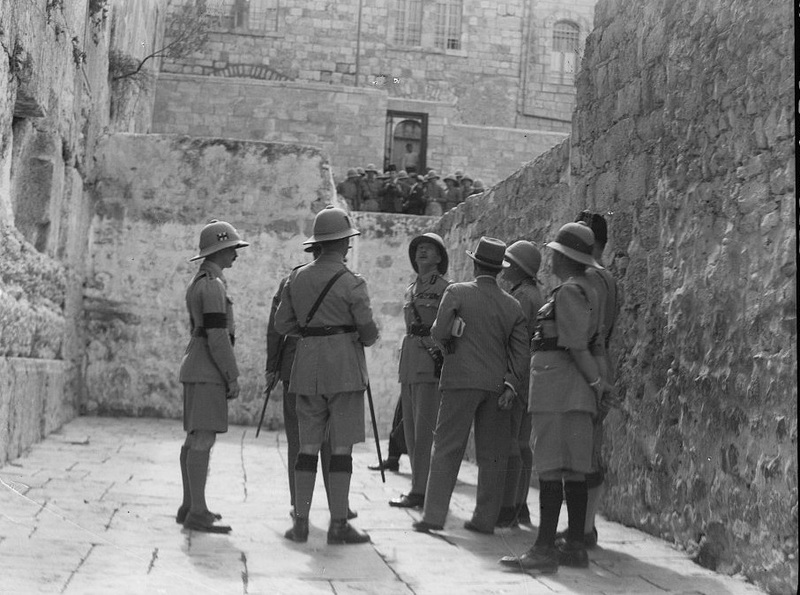 To maintain order in the Old City, the British police established gun positions and built walls to separate Arabs from the Jews. In 1929 and again in 1939 the British evacuated Jews from the Old City. 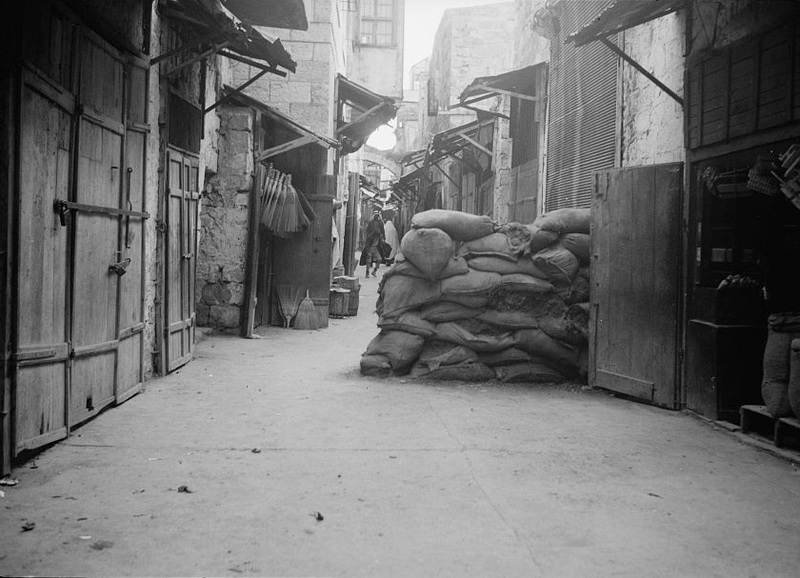 In 1948, the Jordanian Legion captured the Old City of Jerusalem, imprisoned or expelled all of the Jews, and destroyed the Jewish Quarter. Jews were not permitted to visit the Western Wall until 1967 when the Israel Defense Forces reunited the city. On October 29, 1937, Arabs shot at a party of Jews on their way to the Kotel and killed one Jew, Aharon Alkabetz, and two others severely wounded, members of the special Betar Plugat HaKotel group that would accompany worshipers to a from the Kotel due to Arab violence. 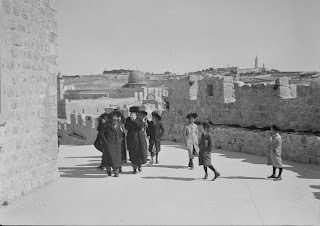 The following Shabbat, despite a British curfew, a group of Betarim, led by Eri Jabotinsky, son of Ze'ev, Netziv Betar Eretz-Yisrael, and Dr. Shimshon Yunitchman, commander of the Betar squads in the Gallil and another few walked demonstratively to the Kotel through crowds of threatening Arabs. At the last moment Rabbi Weingarten, the Rav of the Kotel came, and a minyan was able to engage in communal prayer. Was there an eruv in place that allowed carring on Shabbat? Are the walls of a city an eruv?